As of April 2015, there is no active local in the Solent region. The nearest locals are Brighton and Bristol. 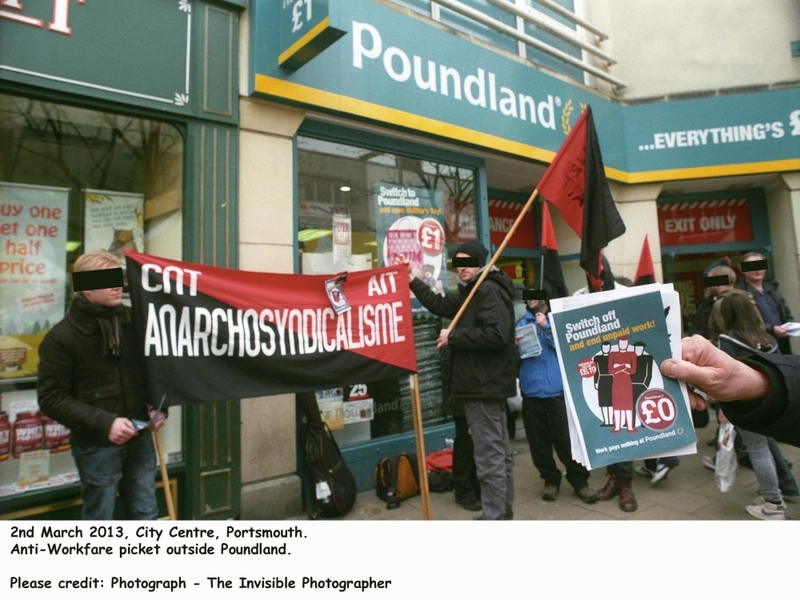 On the 2nd of March, Solent SolFed with comrades from Bristol and Brighton locals along with CNT-AIT Caen, Forest of Dean Anarchists, Wessex Solidarity and others, picketed Poundland in Portsmouth as part of our rolling campaign against the mendacious workfare provider (they keep staying they’ve pulled out). This particular shop had two employees working for JSA however. A communications blockade will follow on Monday 17th. Here are two members write ups of the pickets Solent SF were involved with last week! Protest picket of the Communication Workers Union. Most people will have heard about the CWU leadership endorsing the Royal Mail's participation in the workfare scheme, whilst at the same time ignoring rank and file members views on forced labour and attacks on workers rights. Concerned posties from SOLFED, IWW, Boycott Workfare, and CWU send you the following call out, and request for solidarity. See you on the picket! Read more about Solent Solfeds First Picket!